Disney celebrates a modern-day classic from the directors of The Little Mermaid and Aladdin. 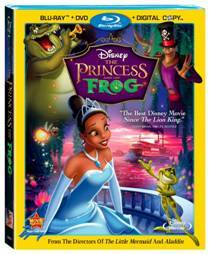 Discover what really happened after the princess kissed the frog in an inspired twist on the world's most famous kiss. This hilarious adventure leaps off the screen with stunning animation, irresistible music and an unforgettable cast of characters. Enter Princess Tiana's world of talking frogs, singing alligators and lovesick fireflies as she embarks on an incredible journey through the mystical bayous of Louisiana. Spurred on by a little bit of courage and a great big dream, these new friends come to realize what's truly important in life...love, family and friendship. Overflowing with humor and heart, The Princess and the Frog is an incredible motion picture experience your whole family will want to enjoy again and again!